Title: Ace Attorney: Sono “Sinjitsu”, Igi Ari! The new Ace Attorney Anime, modeled after the popular game series, streamed on Crunchyroll as of April 2. 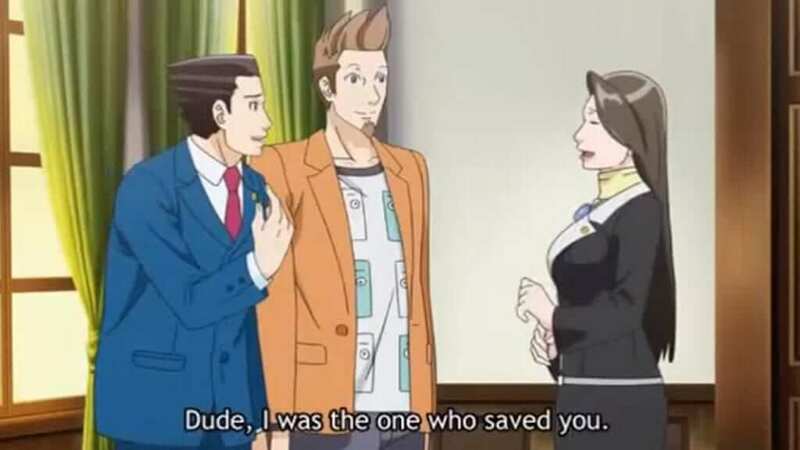 In the first episode, protagonist Phoenix Wright (Naruhodo Ryuichi), a new defense attorney, takes on a murder trial in the hopes of clearing his friend Larry Butz (Yahari Masashi) of his alleged crime. 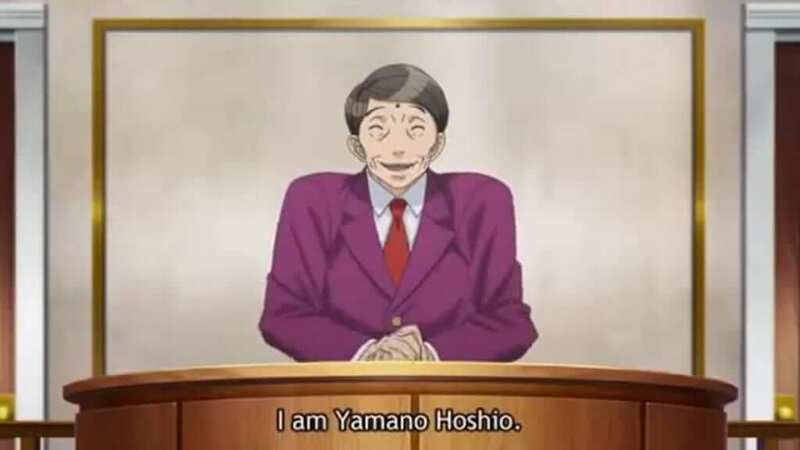 His mentor, Mia Fey (Ayasato Chihiro), enters the courtroom at his side to offer her support and guidance. True to anime form, it didn’t take long (five minutes into the episode, on the mark) for something silly to happen. Immediately after, all sides gather at their places and the atmosphere takes a turn for the tense with a serious musical score perfectly delivering the gravity of the situation–a man’s future hangs in the balance, after all. Well, with a name like Larry Butz, I can’t say I blame him. Of course, it helps that a short spoiler in the show’s opening moments all but gives the mystery away. This, and the fact that the player must naturally win their cases in the games to proceed makes the anime much more about the journey and the tribulations and lessons found along the way than about the conclusion. Boiled down to its elements, Ace Attorney could easily be classified as a puzzle/slice of life show for the way it takes its audience by the hand and leads them along through the events as they unfold. And let’s face it. 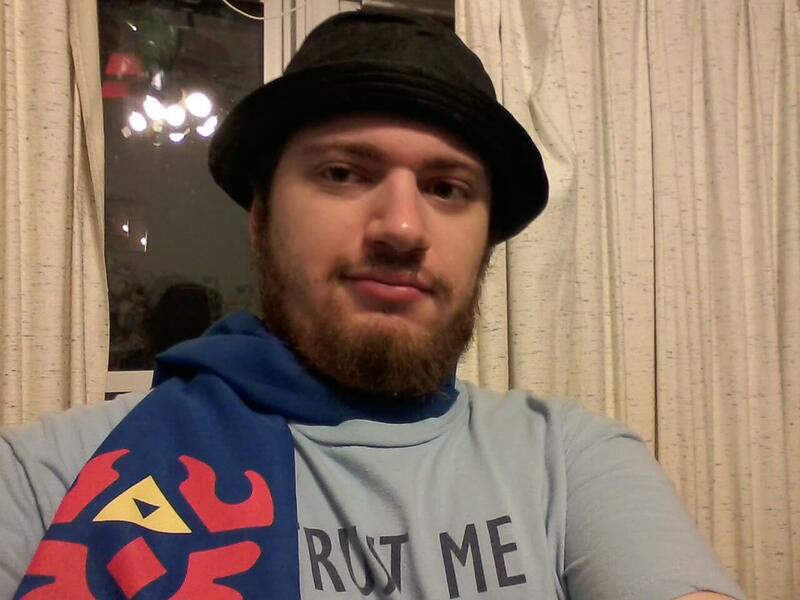 One look at this guy and it’s obvious he’s a sleazeball. Speaking of which, as a game-based anime, there are naturally more than a few nods to the source material. However, these moments are interspersed suitably and timed well so that they never get in the way of the show but are there for those who care to spot them. One also needs not be familiar with the games to be able to identify most of them, as they, for the most part, are quite obvious when they happen. These effects are a treat that could easily have been overdone and made frivolous and annoying, but were thankfully handled well and blended in with the episode’s spontaneous personality. Ace Attorney’s first episode ends on an inspiring note, followed by an ominous one that nearly gets lost underneath the upbeat background music. With the episode ending, this final sequence feels rushed and squeezed in just for the sake of having it all in there. It’s a show that, at least for the time being, doesn’t allow itself to get too bogged down in the gloom. It’s presented from start to finish as the sort of plot that can really only have a happy ending, but the journey there is decidedly worth the watch. If one goes into Ace Attorney expecting to be greeted by a host of friendly characters whose only desire is to entertain and intrigue the viewer, a good time will be had by all. Though I don’t think I’ll ever get over the fact that Phoenix rides a bike to work. Ace Attorney is a show targeted very narrowly at fans of the games. As such, those unfamiliar with the series likely won’t get as much enjoyment out of watching the courtroom antics as those who have played them. 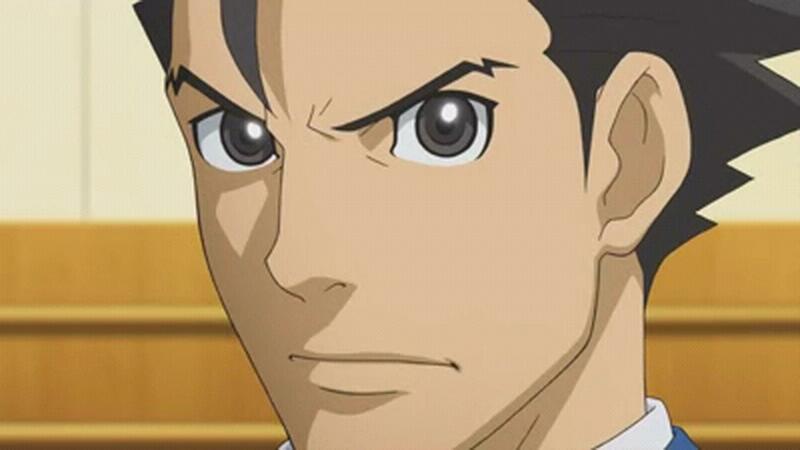 However, knowledge of the games, characters and plots is by no means necessary to understand and enjoy the anime; in fact, the details of the testimonies and evidence are presented in such a way that they stand out very clearly to the viewer, who can’t help but puzzle through every piece as they watch Phoenix Wright do the very same. The episode is also available on Youtube and I definitely recommend watching it through to the end before you make the decision whether or not the series is for you. It’s one of those series one watches not for the plot but for the sheer entertainment value of multiple personalities duking it out in a battle of wits, unleashing the occasional dramatic screen effect that will please game fans but possibly falls flat with new viewers. Without the games as the context for these effects, they seem quite out of place, but it also becomes immediately apparent that such are in fact references to the source material and so are easy to turn around and appreciate. The show has only just begun and is very likely to pick up steam with the next episode. 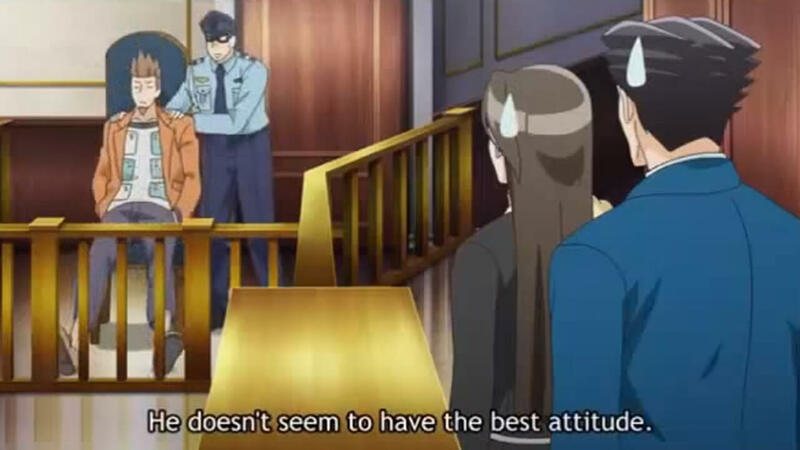 Animation: Being confined to a courtroom for most of the episode, Wright, and co. don’t move around much. The majority of the animation quality is apparent in their gestures and expressions, which tend to be stiff much of the time. On the flipside, they rarely hold still for more than a moment. Sound: There are several effects and scores taken from the game, and each is used with excellent timing to convey the emotion and drama of the back-and-forth nature of the legal battle between the cast. Occasionally the implementation comes off as cheap or outright non-sequitur, contrasting completely with the mood of the dialogue or monolog. Story: Ace Attorney’s plot never goes in very deep. Often the thin layer of the surface has little substance beneath it, preferring to focus on piecing the puzzles together before briefly revealing the full story, as opposed to drilling down to the details in order to solve said puzzle. Characters: Wright and his friend Larry have by far the most personality out of the entire cast. The rest of them remain strictly two-dimensional, in large part due to the fact that A-1 Productions adhered so strictly to the game’s plot that none of them were given the chance to develop naturally and grow larger than the context that birthed them. Rookie Attorney Phoenix Wright takes on his first murder case in order to defend his friend, whom he is positive remains innocent despite the apparent evidence against him.